Is the article author an expert on the history of weather, enabling him to imply with authority that the weather patterns were changing? Hardly. 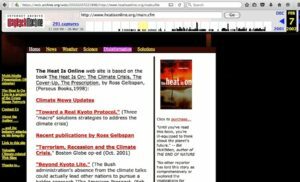 He was and is a writer of material having nothing to do with the climate. 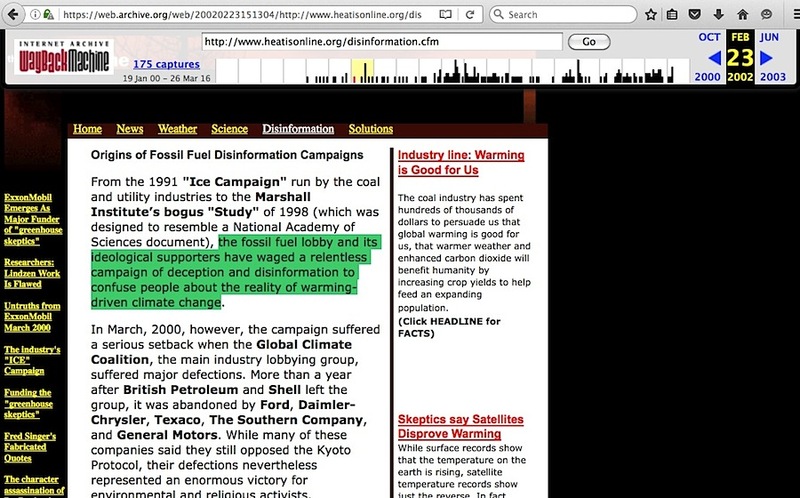 … the fossil fuel lobby and its ideological supporters have waged a relentless campaign of deception and disinformation to confuse people about the reality of warming-driven climate change. See how well this works? “Settled science” / “corrupt skeptics.” And by default, everyone may ignore skeptics because of those two points. Just don’t question anything about that. Ask what actual evidence Gelbspan has ever offered proving the existence of any such ‘deception and disinformation’ campaign, and you soon see how his core evidence is not what he says it is, and how his narratives about discovering it break down. 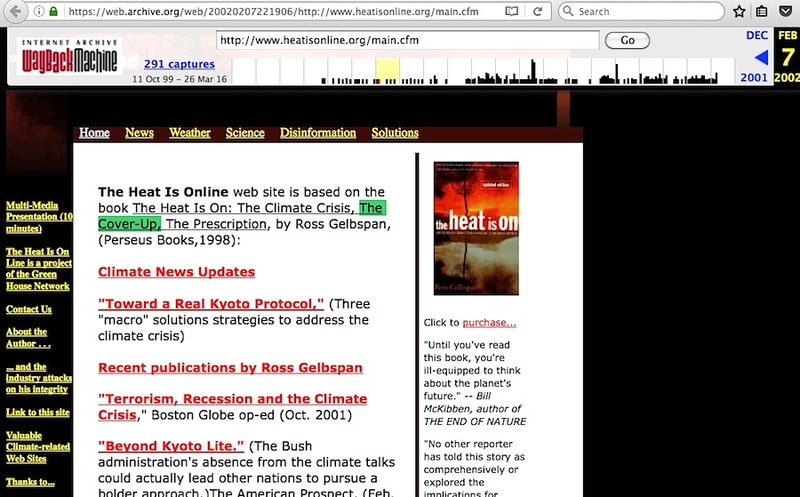 From that, the average reader might start to wonder if assertions about unprecedented weather fall apart, and if the same thing happens to assertions about ‘time spent by viewers watching The Weather Channel’ back in 2002, and if Gelbspan’s own website traffic was actually increasing back then. 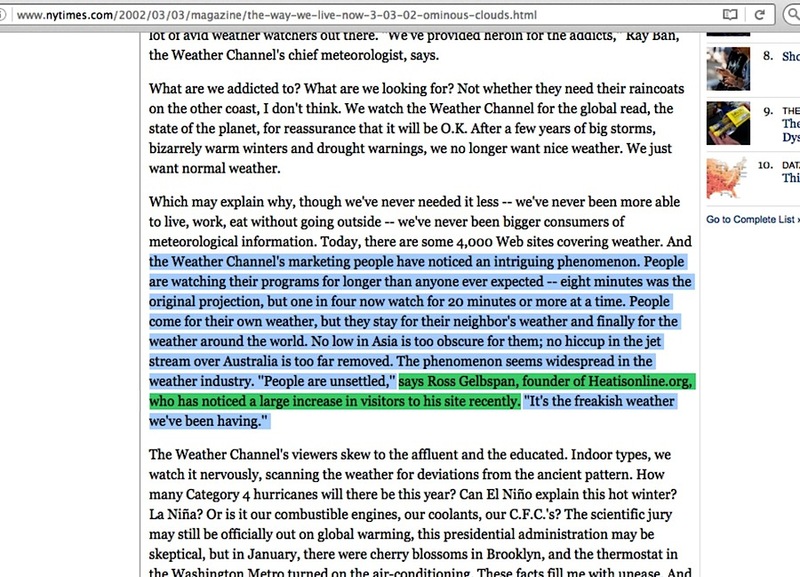 Perhaps the change in viewer length of The Weather Channel can be explained away via its reports becoming longer and less repetitive, but the history of major weather events cannot be erased, nor can myriad problems with Gelbspan’s own narratives. 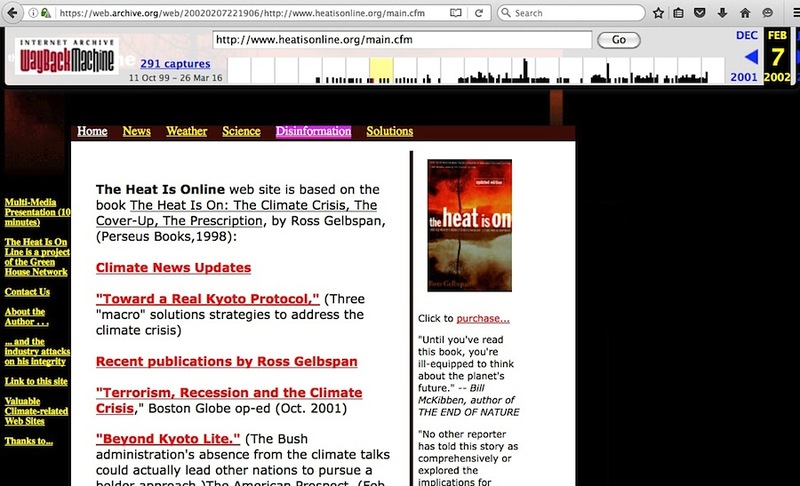 Given how cancerous doubt creeps into anything associated with Ross Gelbspan, the mention of his name in the above NYT article doesn’t look casual, it looks like an effort to steer readers into a non-science website that’s not subtle about its true focus, in order to bolster an article which seems to have the intent of planting the idea about man-caused global warming causing extreme weather events.